As much as we liked Life is Strange, we’re still not 150% sold on the upcoming three episode prequel, Life is Strange Before the Storm. It looks like it’s in good hands so far and should provide more color on Chloe’s life “before the storm”, so we’re still on board. See the new Chloe & David gameplay trailer and a trio of screens too. 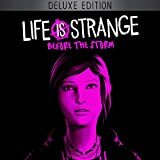 Life is Strange: Before the Storm – Episode 1 “Awake” debuts on the PS4, Xbox One and PC on August 31st, 2017. Returning to a familiar setting in Arcadia Bay, this brand new gameplay shows a 16 year-old Chloe Price who is still struggling with her father’s death and trying to deal with the unwelcomed entry of a new father figure, David, into her life. After a blurred awaking following events in the Mill the night before, this scene – which is cut together from a much longer sequence in game – unveils Chloe’s house for the first time in Before the Storm and provides fans a glimpse at Chloe and David’s turbulent relationship.